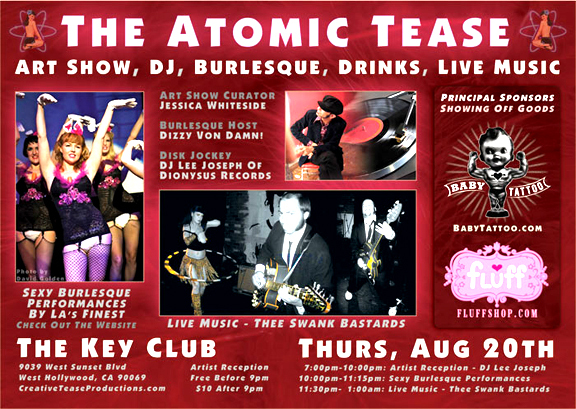 DJ Lee of Dionysus at Atomic Tease on Thursday night! The Atomic Tease is a presentation of the neo-burlesque movement, bringing together pin-up inspired art, burlesque performance and music. What started as an undercurrent in American counter culture is now seeping its way into mainstream consciousness – and rapidly spreading through fine arts, music and theatrical productions. The neo-burlesque movement is informed by classic burlesque elements of sexuality, satire, and counter culture – blended with the low brow art scene, modern social and political themes, mid-century pin-up art, California surfer/tiki culture and a splash of fantasy. Join us for a night of paintings and pasties from contemporary artists and burlesque performers emerging as some of the hottest stars of their generation! ALSO: New and original paintings by Jessica Whiteside, Noir Nouar, Anne Faith Nicholls, Atomikitty, and Claudette Barjoud. Join us for Tiki Oasis 9, August 14 – 16 at the Crowne Plaza, San Diego! This years entertainment includes Davie Allan and The Arrows on Thursday, DJ Lee from Dionysus spinning records poolside Saturday 3 pm – 6 pm and many other fabulous musical groups and DJs. Canadian artist Heather Watts (creator of both the Kava Kon and Skip Heller CD covers) will be once again making the scene selling her velvet paintings and jewelry. We will also be vending a lot of Dionysus and other vinyl, CDs, magazines and more from the Tiki News booth! 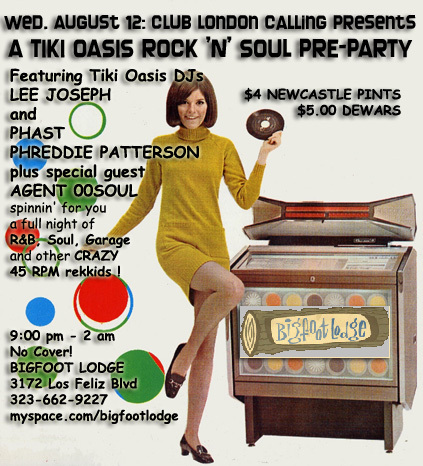 Tiki Oasis Pre-Party Wed. August 12th at Bigfoot Lodge!